The monk Kallinikos Stavrovounitis, who is considered one of the foremost iconographers in pan-Orthodoxy, left this world last night (January 23, 2011), full of days. 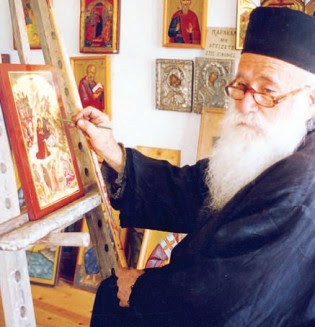 The iconographer monk Kallinikos was born in 1920 in the town of Athienou of Larnaca, Cyprus. At 20 years of age he entered the monastic life at the Holy Monastery of Stavrovouni and in 1946 departed for Mount Athos, where he was apprenticed under Fr. Ioannikios Mavropoulo from whom he was initiated into the art of iconography. Participating in the freedom struggle of Cyprus (1955-59), he was captured by the British, and was tortured and imprisoned. Even in prison he did not stop his iconography. After his release he went to Athens and took lessons from Photi Kontoglou, getting the relevant certification for Byzantine Iconography. Aiming to obtain more knowledge, he visited various places such as Mystras, Mount Athos, Meteora, Veria (Beroia), Thessaloniki, and Mount Sinai. He investigated more than any other younger iconographer the technique of fresco and movable icons. In discussions with iconographers and Byzantinists, with chemists and geologists, he studied and experimented with lime, straw, flax, cellulose, egg and colors. At the Monastery of Saint Catherine at Mount Sinai, he studied the encaustic technique and was able to learn the secrets of hot wax painting. His works have been exhibited in various exhibitions both in Cyprus and abroad, including: Athens, Hamburg, Frankfurt, Kiel, Berlin, Paris, London and Lausanne. It should be noted that, at the initiative of Father Kallinikos and a donation of a large number of icons, the Kallinikeio Municipal Museum was founded and operates in his birthplace, Athienou. Father Kallinikos was active in the art of iconography for more than fifty years, handing down to us the tradition of our ecclesiastical iconography, depositing his experience and knowledge, and gave with his work a new impetus to the technique of icon painting. The funeral service for Father Kallinikos will be celebrated tomorrow at 3 pm in the Holy Church of the Panagia in the community of Athienou.